This document presents the import/export functionnalities of Chimère. It has been updated for version 2.0.0. In Chimère the import mechanism is based on Import object. These objects are stored in database to keep trace of imports and to facilitate the re-importation from the same source. In fact if possible the update of data from a same type of source is managed. The ability to do such updates depends on the existence of a unique id for each object on your source. To add an Import object you need to go to Chimere > Imports then Add. 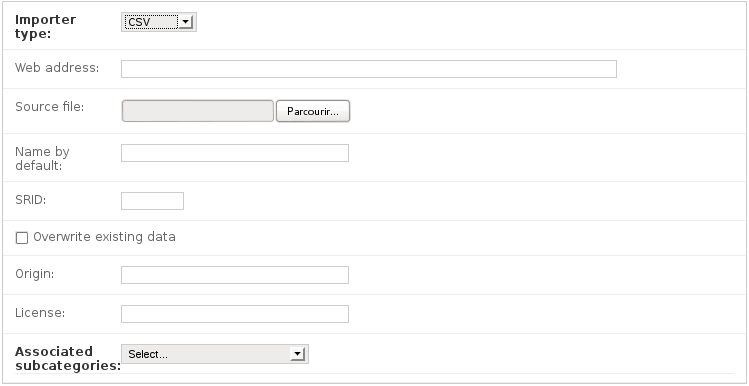 After that you’ll have to select your source type and then the form depends on this source type. Name by default: if no name can be identified to the newly imported object this is the name that will be used. If this field is empty the name of the associated category will be use. SRID: Chimère will try to identify automatically the correct coordinate system from the given source. But sometimes the information is not present or cannot be guessed (for instance a Shapefile that uses non standard proj file). In this case Chimère will use WGS84 by default (the classic latitude/longitude) but it is not always correct. If you experience problems with items localisation you should put here the SRID associated to the coordinate system of your source. Overload existing data: by default when data is updated on the source and has been changed in your Chimère instance a new item is created and has to be reconciled with the amendment form. 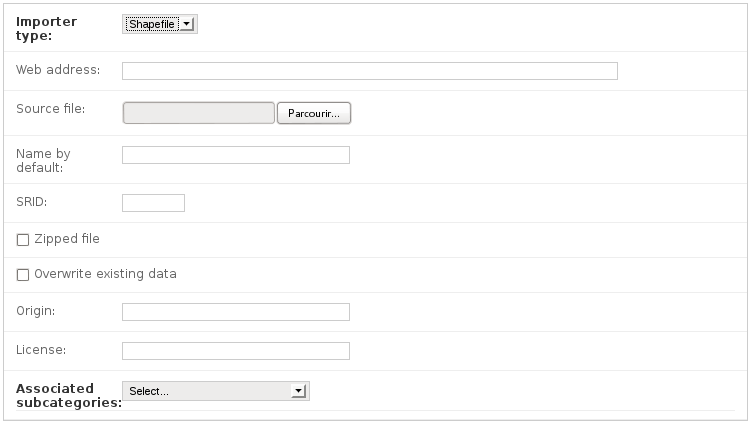 If you don’t want to use this form and then overwrite with the data from the external source, check this option. Get description from source: If this case is checked, the importer will try to get the description from the source file. This option is only available for certain file formats. Default description: A default description to be added to new items. This field is only available when Get description from source is not checked. Origin: if not null this field will be associated to each item imported in order to easily identify where the item came from. For OSM import the source is automatically added. License: if not null this field will be associated to each item imported in order to easily identify the license associated to the item. For OSM import the license is automatically added. Associated subcategories (mandatory): The selected subcategories will be associated to newly imported items. Web address/source file (mandatory): your KML could be distant or a local file. You’ll have to fill one of the two fields. 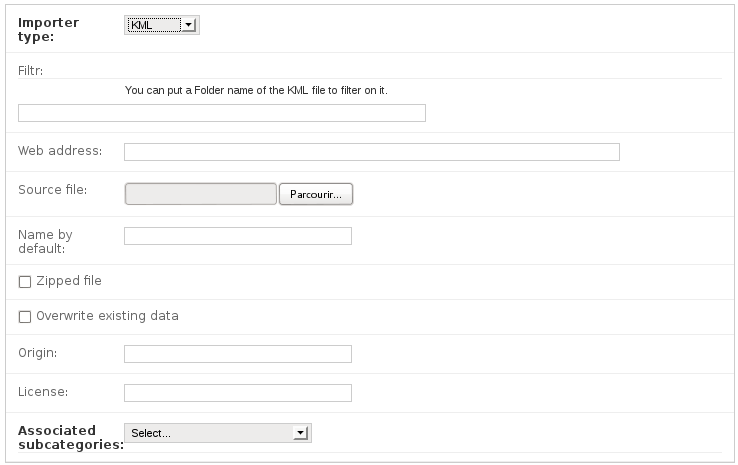 Filter: if you want to import only a specific Folder of your KML file put his name on this field. Zipped file: if your source is a KMLZ file (a zipped KML), check this case. Web address/source file (mandatory): your Shapefile could be distant or a local file. You’ll have to fill one of the two fields. Zipped file: only zipped Shapefiles are accepted so this checkbox has to be checked. Simple GeoRSS and W3C GeoRSS are managed. Web address (mandatory): only distant GeoRSS are managed. The format of the CSV file (number and order of columns) managed by Chimère varies depending on the properties you have added on your Chimère instance. So we recommend you to first do an export of some items in CSV with Chimère. The CSV format of the exported file will meet Chimère requirements. By the way because of the geometry of the item this format is not very convenient to add new content but could be handy to update informations. If you mean to update existing data by this import, unless you know how to edit WKT do not modify the geometry column. Web address/source file (mandatory): your CSV file could be distant or a local file. You’ll have to fill one of the two fields. To import from OSM Chimère use the XAPI API of OSM. Web address (mandatory): XAPI url used to import data. This field should be filled with a default address. By default the MapQuest server is used as it seems to be the more robust. If you experience problems with OSM import, check the availability of the XAPI server used and eventually change it. Filter area (mandatory): draw the bounding box you want to use for your OSM import. Filter type (mandatory): choose if you want to import way or nodes. Filter tag (mandatory): choose the OSM key/value couple used to filter OSM data. A link to the OSM Map features page is provided to help you find appropriate values. Refresh button: this button convert your choices to appropriate XAPI args. You have to hit this button before validating the form. Once your new import item created, select it in the import object list, choose the Import action and validate. The import should be processing normally. If not, an explicit error message should be printed in the state column of your import. If you launch the command without import_id the list of imports available is presented and you can choose one. All new imported items have the state Imported. To make them available on the map you’ll have to validate them. If you don’t want some items to be visible on the map, instead of deleting them it is recommended to set them to the state Disabled. So on the next update from the source, rather than appear as new items they remain disabled. Be careful with duplicates between your existing data and imported data. This is particularly important if you want to export your data to OSM. Directly from the geographic items list you can export to the chosen format. All you have to do is to select the desired items, choose the appropriate action in the action list and validate. If you launch the command without arguments you will be prompted for the choice to make for your export. If you are not sure of what you are doing with OSM export: don’t do it! It is really important to not mess with others’ data. Only export of OSM nodes are managed. the area concerned by your export. the key/value tag to append to your new/updated items. the subcategories concerned by your export. If you think that some items in these subcategories should not be in OSM database (because there are not relevant or because of license issues) beforehand mark them as Not for OSM in the import fields of the geographic items forms. The OSM export in Chimère is designed to be the more preservative possible in regards to OSM database. That’s why before any export an import is done. If the new import has updated data, treat them before doing an export (cf. manage imported data). To launch an export select the appropriate Import object in the imports list. Then select the Export to OSM action and validate. Then you’ll be asked for your OSM username and password and the API you want to use. 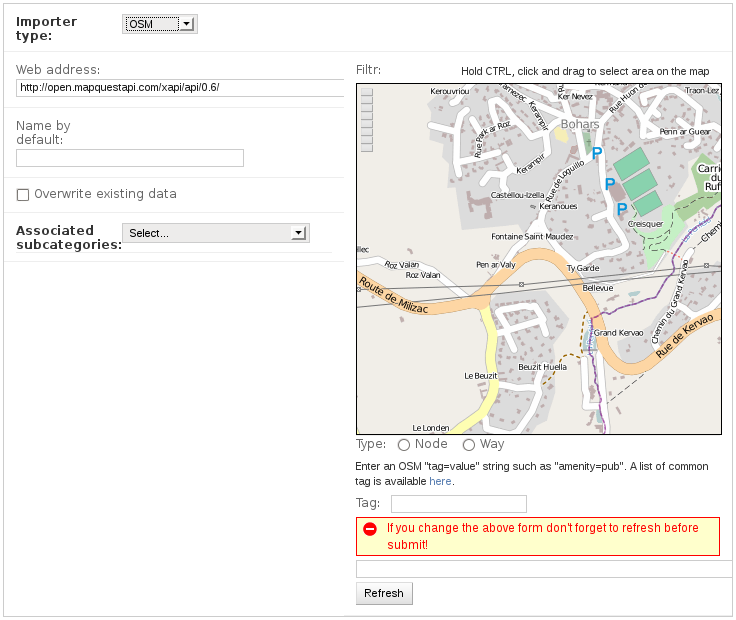 If you regularly use Chimère to do export, it is recommended to create an OSM specific account for that. The test API is available to make export test. If you want to use the test API you’ll have to create a specific account on the test platform. The data on the test platform are not synced with the main platform. You won’t have the same data than the ones you got with XAPI. Once all this field filled, you can (finally!) launch the export. name: get from the item name in Chimère. source: to identify Chimère as a source.